Edinburgh, Scotland's impressive capital city, enjoys a particularly scenic location, surrounded by volcanic hills on the southern edge of the Firth of Forth. On the east coast of Edinburgh is the popular seaside resort of Portobello, and to the south are the Pentland Hills. The Firth of Forth is situated to the north of Edinburgh and has several elegant bridges, and the large port town of Leith is also close by. You are able to see the whole of Edinburgh from the top of Arthur's Seat, an extinct volcano which is one of the city's biggest tourist attractions in all respects. The historic Old Town is overlooked by the Salisbury Crays and their rocky battlements, while the New Town area is especially elegant, with organised rows of Georgian terraces. Located on Princes Street is the Edinburgh and Scotland Tourist Information Centre, which offers a handy accommodation booking service and tickets for city buses and tours. On the easterly outskirts of the city is the Old Craighall Tourism Centre, while a further tourist information desk is to be found at Edinburgh Airport, in the suburb of Turnhouse. The recent addition of numerous new hotels has helped to greatly improve the city's overall tourist capacity, although do bear in mind that during the August festivals and New Year's Hogmanay celebrations, you will need to book many months in advance. Those bringing a car to Edinburgh will find that parking in the city centre is difficult, and so if you choose to stay in this area, do make sure that your hotel has a car park of some description. Alternatively, consider looking for accommodation in suburbs such as Bruntsfield, Newington and Tollcross. 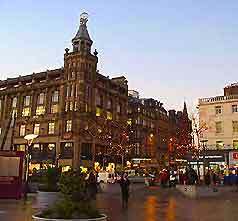 Mid-range hotels are particularly plentiful in the Old Town, around Cowgate, Hunter Square, St. Mary's Street and off the High Street. Edinburgh accommodation includes many impressive luxury hotels, town-house value hotels, a great range of affordable hostels, award-winning bed and breakfast guest houses, and cheap travelodges on the outskirts. There are even some self-catering apartments and campsites in this part of Scotland. Stunning architecture and natural geology combine to create a wonderful blend in Edinburgh, giving the city tremendous character. 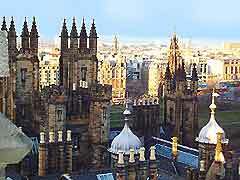 The Old Town area of Edinburgh, with its crowded testaments, stands in complete contrast to the highly organised grid of the New Town area, with its orderly Georgian terraces. There are stunning vistas from almost every street and much character. Popular tourist attractions include the Edinburgh Experience - featuring a 3D film, which explains the history of the city; the Royal Observatory Visitor Centre - offering spectacular views across the city and surrounding area; Edinburgh Castle - one of the most famous and important landmarks here, in constant use for more than 1,000 years; Craigmillar Castle - a substantial and atmospheric ruin managed by Historic Scotland; and the remarkable Royal Yacht Britannia - now docked here after being decommissioned in 1997, following 44 years of Royal service. Other attractions here include the Edinburgh Crystal Visitor Centre - founded in 1867 with glass-blowing displays, a factory shop and a crystal glass shop; the Scotch Whisky Heritage Centre - with guided tours explaining the distillation process of this important Scottish whisky; the Scott Monument - created in 1846 as a monument and memorial to the famous Sir Walter Scott, with almost 300 steps to the highest gallery; Calton Hill - home to the Nelson Monument and the city's National Monument; the Palace of Holyroodhouse - built by James IV, with antique furniture, tapestries, paintings, historic artefacts from several centuries and the lavish private apartment of Mary, Queen of Scot; and the Royal Mile - the oldest part of the city and marking the road running directly from Edinburgh Castle down to the Palace of Holyroodhouse. 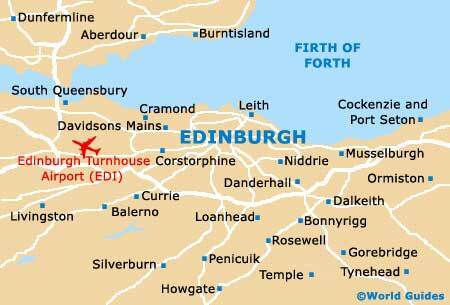 More information about Edinburgh Tourist Attractions and Edinburgh Landmarks. Attractions for children include Edinburgh Zoo - with pandas, hippos, snakes, lions, monkeys, marmosets, zebras and the world's largest group of penguins in captivity; Deep Sea World - an award-winning tourist attraction with a 71-metre / 232-foot transparent tunnel, offering excellent views of large fish, sharks and numerous impressive sea creatures; the Gorgie City Farm - an idyllic city farm with many friendly farmyard animals and gardens; the Butterfly and Insect World - a tropical greenhouse paradise which is home to many colorful butterflies and a number of large insects and spiders; the Bird of Prey Centre - with over 30 different species, including eagles, falcons, hawks and owls; Laserquest - an exciting and energetic futurist laser game; and several soft-play centres for younger children holidaying here. 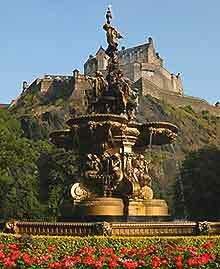 Edinburgh has a number of theatres, providing regular performances, dramas, operas, concerts and cabarets. These include the Festival Theatre, the Kings Theatre, the Royal Lyceum Theatre, the Traverse Theatre, the Assembly Rooms and the Bedlam Theatre. The city is also called home by a series of museums, which provide interesting information on the history of Edinburgh and this part of Scotland. Some of the major museums here include the John Knox House Museum, the Museum of Childhood, Edinburgh's Museum of Scotland, the Newhaven Heritage Museum, the Royal Museum and the Museum of Edinburgh. There are many areas nearby worth visiting, such as Glasgow, East Lothian, Midlothian, West of Edinburgh, Fife, the Borders and Stirling, all offering an enormous amount of things to see, do and enjoy. With popular celebrations taking place throughout the year, including the International Science Festival in April, and in August, the Edinburgh Military Tattoo, the Fringe Festival, the International Film Festival and the Edinburgh Book Festival, this cosmopolitan and sophisticated Scottish city is even busy during the winter months, when the weather is at its coldest.